Chicago craft brewery Goose Island has announced that its rare and multi-award-winning Bourbon County Brand Stout (15.2% ABV) will return to UK shores this Black Friday (23rd November). But, if the track record is anything to go by, craft beer fans will need to be quick if they want to nab a bottle of the highly sought-after beer, with round-the-block queues of beer enthusiasts expected. When first launched in 2016, the limited run of 100 bottles sold out in under an hour, and in 2017 the beer sold out online in under four minutes! Traditionally launched in the US on Black Friday – the day after Thanksgiving – the eagerly anticipated bourbon-barrel-aged imperial stout will be available for £20 (16.9oz bottle) in limited quantities at Kill the Cat in Shoreditch, Ghost Whale in Brixton from 11:00 GMT, and on Beerhawk.co.uk, whilst stocks last, from 13:00 GMT. 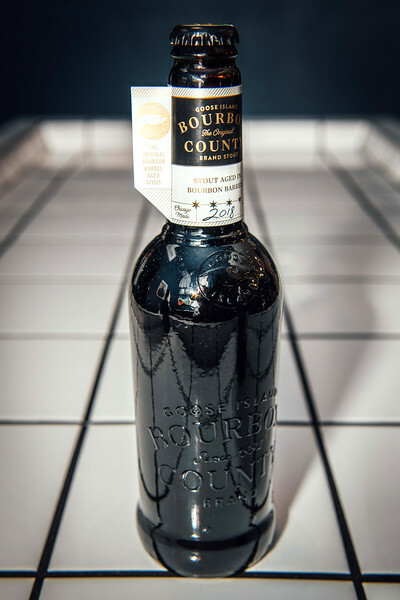 If you want to learn more about Bourbon County Brand Stout 2018 and other variants available in the US please visit: https://www.gooseisland.com/blog/announcing-2018-bourbon-county-variants. For more information please contact the Goose Island Press Office on gooseisland@theacademypr.com or 020 7100 7100. Eager beer lovers across London braved the cold for a £20 bottle of 2018 release of Goose Island’s Bourbon County Stout (ABV 15.2%); an exclusive, limited run bourbon-barrel aged imperial stout. Fans in Shoreditch lined-up from 8:00am, indulging specially paired Crosstown doughnuts and an exclusive taste of Goose Island’s Cooper Project Barrel-Aged Porter.